ADEJE, 29 June 2016. Siam Park Tenerife celebrates a new awarded Travellers’ Choice 2016 Award which is presented to the park by Trip Advisor, a prestigious travel web portal, for the third consecutive year, as one of the best water parks in the world. 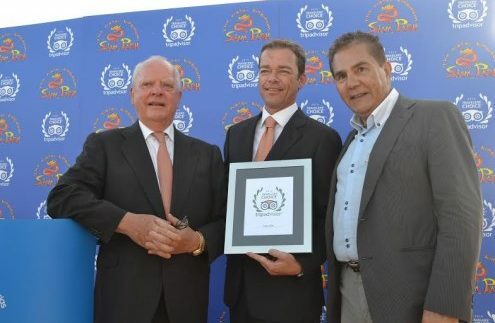 The event was held at the most paradisiacal beach in the Canary Islands, Siam Beach and was presided by the President of Loro Parque and Siam Park, Wolfgang Kiessling; and the Vice President, Christoph Kiessling. Among the authorities in attendance were the Vice Counsellor of Tourism of the Canarian Government, Cristóbal de la Rosa, the Counsellor of Tourism of Tenerife’s Island Council, Alberto Bernabé, and the mayor of Adeje, José Miguel Rodríguez Fraga. Many representatives of the tourism sector of the Canary Islands as well as a large group of journalists from major national and international media also attended the event. Siam Park world’s best water park 2016 – TripAdvisorBlanca Zayas, Director of Communication of TripAdvisor in Spain, presented the award to the Vice President of the Park, Christoph Kiessling, who said with emotion that it is a “an honor to Siam Park Tenerife to receive the Travellers’ Choice Award of TripAdvisor for the third consecutive year – a recognition that is the result of teamwork”. In this regard, he expressed his satisfaction that “dedication to service and love for detail are recognised by visitors from around the world; we are extremely grateful and this award will encourage us to continue working with effort and enthusiasm for excellence every day”. As a representative of the Council of Tenerife, Alberto Bernabé stressed that Siam Park Tenerife is a true enjoyment for its visitors. That is the reason why tourists come back and others are curious to come to Tenerife. This experience ensures the visitors return home fully satisfied. “This sense of satisfaction is key of our common labour.” In addition, he confirms the excellence has become the trademark of the whole Loro Parque family. The mayor of Adeje congratulated, in his speech, the entire team of Siam Park Tenerife and highlighted the huge effort and involvement of the Kiessling family in the community, by generating jobs in Adeje and its surrounding areas. About 200 people who attended the event enjoyed a lively cocktail where they could converse about the new gran achievement at Siam Park Tenerife.